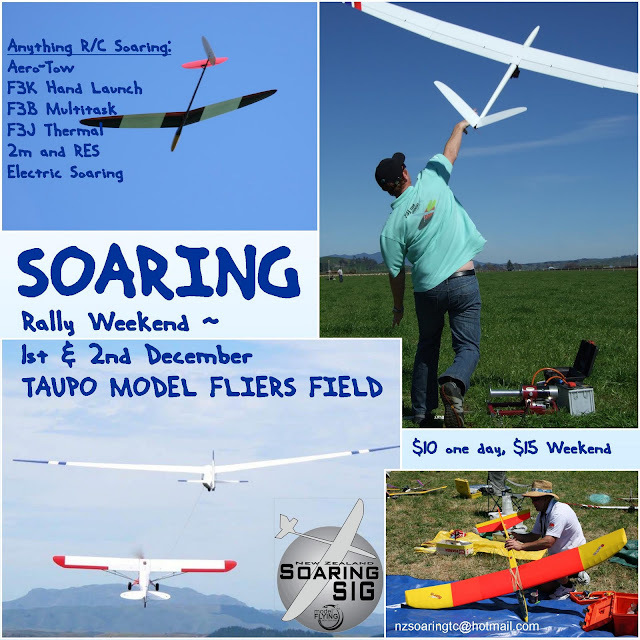 The North Island Soaring Rally is on the 1st & 2nd of December at the Taupo Model Fliers Field. Open to all forms of R/C Soaring including Aero-tow, 2 meter, RES, F3J Thermal Duration, F3B Multitask, F3K Discuss Hand Launch glider and Electric Soaring. Contact Bill DeRenzy on 027 788 594 or David James on 027 244 7782. We hope to have two great days of soaring. Download the Rally Bulletin here. FEE: $10.00 One day & $15 for Weekend. Taupo Model Fliers strip - NO flying over the Gliding Club Airstrip. ACCOMMODATION: Taupo Top 10 Holiday Park.